What is the Roth IRA 60 day rollover rule? This is an important rule to know if you've recently performed a Roth IRA rollover or if you're considering one in the near future. The 60 day rule comes into effect whenever you perform a rollover of funds from one account to another, and you take actual possession of the funds. In such a case, you have 60 days to "roll" those funds over from the first account to the second. For instance, let's say you switch jobs and you want to perform a rollover of your 401k plan from your old employer to your Roth IRA. You notify your old employer, and they send you a check for the balance of your 401k account. In this instance, you have 60 days to roll those funds over (contribute them) to your Roth IRA. Otherwise, you may face a 10% early withdrawal penalty. So how long is 60 days? Is it 60 business days or 60 calendar days? According to the IRS, the 60 day period ends on "the 60th day following the day on which the participant receives the distribution." That's 60 calendar days, not business days, and yes - holidays and weekends count. You can receive a Roth IRA 60 day rollover rule extension if your deposit is frozen at any time during the 60 day period. For instance, let's say the financial institution holding your deposit is deemed insolvent and closed by the FDIC. In such a case, the time during which your deposit is frozen does NOT count toward the 60 day timeframe. In addition, the 60 day window can NOT close less than 10 days after your deposit is no longer frozen. Aside from this rare exception, you likely have only 60 calendar days to complete your rollover before facing taxes, penalties, or both. If you're moving funds from a Traditional IRA to a Roth IRA, the Roth IRA 60 day rollover rule takes effect. Because you're moving funds from an account typically funded with deductible contributions to one funded with non-deductible contributions, you're probably going to owe some sort of tax liability regardless of your adherence to the 60 day rollover rule. However, unless you're older than age 59.5, then you're probably going to be subject to a 10% penalty if you don't transfer the rollover funds within the 60 day window. For example, let's say you're age 47 and you're in the 20% tax bracket. For years, you've fully funded your Traditional IRA with tax deductible contributions. Now, you've decided that having a good portion of that money in a Roth IRA is good idea. As a result, you decide to perform a $100,000 rollover conversion from your Traditional IRA to your Roth IRA. Since you funded your Traditional IRA with tax deductible contributions, you're going to owe income taxes on the portion you rollover. In this case, 20% (or $20,000). However, since you're under age 59.5, you're also potentially subject to an early withdrawal penalty of 10% unless you either perform a direct trustee-to-trustee rollover or you personally move the funds from your Traditional IRA to your Roth IRA within the 60 day grace period. For instance, let's say you take a direct distribution from your Traditional IRA. The trustee holds on to the 20% ($20,000) for tax purposes and sends you a check for $80,000. If you deposit $80,000 in your Roth IRA a week later (within the 60 day window), then you don't have to worry about the 10% early withdrawal penalty. But if you procrastinate and don't get around to depositing that money in your Roth IRA until three months later (when the 60 window is closed), then you'll owe an additional 10% ($10,000) on top of your regular income tax liability! But that's just one type of rollover, let's look at another example. If you're moving funds from one Roth IRA to another, the Roth IRA 60 day rollover rule still takes effect. While technically you only have one Roth IRA in the eyes of the IRS, you can "roll" money over from one brokerage account to another. A proper rollover from one Roth IRA brokerage account to another will not trigger any taxes or penalties. In fact, it should be rather easy to perform a direct rollover from the first account to the second without every touching the money. But if you do park the rollover funds somewhere else before rolling them over into the second account, then the Roth IRA 60 day rollover rule applies. For example, let's say you in the year 2000 you funded a Roth IRA with Fidelity, and in 2006, you started contributing to a Roth IRA with T. Rowe Price. To simplify your record keeping, you want to merge both accounts by rolling over the funds from Fidelity to T. Rowe Price. If you do so by directly withdrawing funds from the Fidelity account, you have only 60 days to deposit those funds in the T. Rowe Price account. Roth IRA contributions (just the contributions, not the earnings) can be withdrawn at any time tax-free and penalty-free. But can you withdraw your Roth IRA contributions for a short term loan and then put them back? 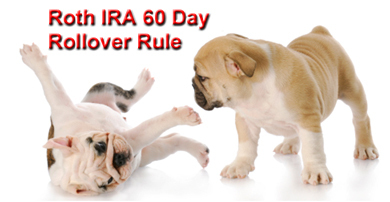 But just like the previous examples, the 60 day rollover rule applies. If you miss the 60 day window, then your Roth IRA contribution for that tax year is limited to whatever amount you could still contribute. For example, let's say you're single, 45 years old, earn $110,000 per year, and have $50,000 in your Roth IRA at the start of the 2011 tax year. Between January 2nd and June 1st, you contribute $2,500 to your Roth IRA. In early June, an emergency crops up and you need to get your hands on some money very quickly. So, you withdraw $2,500 from your Roth IRA. If you want to put that money back, then you must do so by the 60th day following the day you withdrew the money. If you recontribute the $2,500 within the 60 day window, everything is fine. 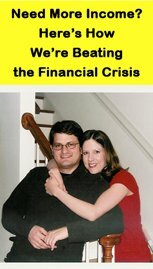 But if you are unable or unwilling to recontribute the $2,500 by the 60th day, then you effectively lose the ability to contribute that $2,500 for the 2011 tax year. Since your contribution limit is $5,000 per year, you'll still have the ability to contribute $2,500 (the second half of your annual contribution), but the opportunity to reimburse your Roth IRA for the initial $2,500 will be lost. If not, assume that after withdrawing $2,500, you managed to recontribute $2,000 of the $2,500 within the 60 day window. At that point, you're still eligible to contribute an additional $2,500 to your Roth IRA by the end of the 2011 tax year, but you're total maximum contribution for the year will be $4,500 instead of $5,000. Frozen accounts to bank insolvency or bankruptcy are not the only exception to the Roth IRA 60 day rollover rule. Other exceptions exist, but they're rare. And "I forgot" or "I tend to procrastinate" just won't fly with the IRS. Nevertheless, they sometimes do apply to you. So if you miss your window of opportunity, all hope is not lost. Under Internal Revenue Code Sections 408(d)(3)(l) and 402(c)(3)(b), the 60 day rule can be waived if, as determined by the IRS, an extension of the rollover period should be allowed for "equity or good conscience." Such reasons may include death, dismemberment, disability, incarceration, hospitalization, foreign detainment, postal error, or restrictions imposed by a foreign government. To seek a waiver, you must apply for a private letter ruling (a written decision from the IRS in response to a taxpayer request for guidance). In making a decision, the IRS will consider if the funds were used, how they were used, and how much time elapsed following the distribution. The best way to avoid making a rollover mistake is to avoid the need for the Roth IRA 60 day rollover rule to begin with. Performing a trustee-to-trustee transfer eliminates the worry of missing the 60 day window since you never actually take possession of the distributed funds. The funds simply rollover from one account to another. This is the method most often suggested by financial professionals, and most brokerage firms and financial institutions should have parameters in place to walk you through the process step-by-step. However, in those cases where a trustee-to-trustee transfer is not available, make sure you adhere to the Roth IRA 60 day rollover rule!